Writing about organ music, a fragment of the first document of the Second Vatican Council, the "Constitution on the Sacred Liturgy", developed in 1963, must be quoted, which reads as follows: "In the Latin Church the pipe organ is to be held in high esteem, for it is the traditional musical instrument which adds a wonderful splendour to the Church's ceremonies and powerfully lifts up man's mind to God and to higher things." In his book "The organs of Toruń and the nearby churches", Marian Dorawa writes about the value of the organ in the life of the Christian community: "The organ is a work of art and material culture and, through the pieces of music performed using it, it is also a culture-creating object. It speaks to the soul of man with the wealth of colour changing tones, as well as visually with the richness of the artistic design of the outer casing. [...] The organ, which during its more than two-thousand-year period of development has undergone many improvements to its construction and operation, as well as enrichment of the sound unit, has climbed to the very top of the pyramid of all musical instruments. Its first builder probably did not think that the musical instrument he put together more than two thousand years ago using some pastoral pipes, and gradually perfected, would once reach the peaks of technology and art. Rightly so stated Wolfgang Amadeus Mozart: In my eyes and my ears the organ is the king of instruments." Pope Benedict XVI, during the ceremony of blessing of the new organ of Regensburg, thus spoke of it: "The organ has always been considered, and rightly so, the king of musical instruments, because it takes up all the sounds of creation and gives resonance to the fullness of human sentiments, from joy to sadness, from praise to lamentation. By transcending the merely human sphere, as all music of quality does, it evokes the divine. The organ's great range of timbre, from piano through to a thundering fortissimo, makes it an instrument superior to all others. It is capable of echoing and expressing all the experiences of human life. The manifold possibilities of the organ in some way remind us of the immensity and the magnificence of God." Marian Dorawa is one of the pioneers of conservation work to restore the original tone and sound to organs throughout Poland. In the introduction to his book prof. Marian Arszyński writes: "At the end of the nineteenth century, a feeling began to arise that old pieces of music are subject to a far-reaching deformation of sound and a distortion of interpretation, if they are performed on instruments which, as a result of changes in the original structure of their musical mechanisms made over the years, lost their original sound. A conviction grew that in these conditions listeners get only a vague idea of the nature of music of a given epoch and of the subtlety of art of its composers. [...] It was in the atmosphere caused by such a situation that in the late nineteenth and early twentieth century a social movement was born in western Europe, which initiated a comprehensive study of ancient organs and called for their preservation in their original condition." 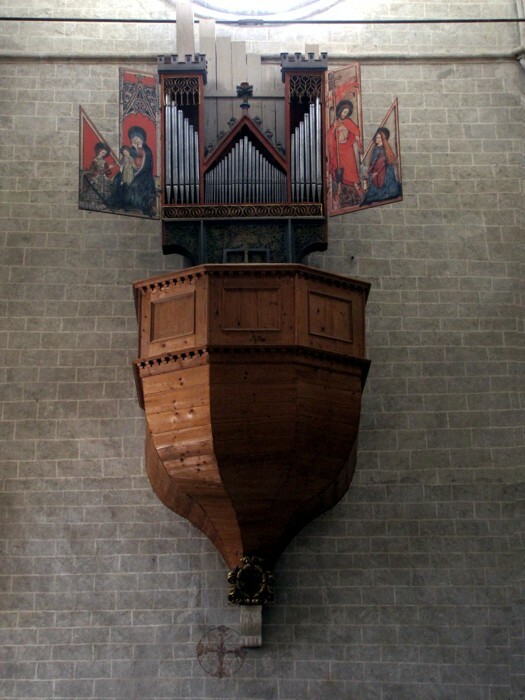 The instrument in the basilica in Sion, Switzerland, is considered to be the oldest organ in the world. The first instrument was constructed there around 1435. Its Gothic painted wings and 135 pipes date back to that period. In 1687, the instrument was extended by doubling the number of organ stops (registers) and such a seventeenth-century layout of its construction, with one manual keyboard with 7 stops, has been preserved to this day. In 1812 one more stop was added to the additionally constructed pedal. The oldest operating organ in Poland is located in Kazimierz Dolny. Built in 1620, severely damaged in 1656 during the Swedish invasion and then renovated, it has most of its original fittings. The organs in Olkusz and Leżajsk also date back to the seventeenth century. From this perspective, we can better appreciate the two oldest instruments in our diocese: the side organ in the Cathedral of Toruń from 1688, and the organ in Przeczno, dating back to the late seventeenth century. Comparing the instruments in Sion, Kazimierz Dolny, Toruń and Przeczno one can easily notice the identical four-octave manual keyboards (C-c''') containing only 45, and not 49 keys, for the lowest octave is the so-called "short octave" (without four tones, with a modified keyboard layout). The organ in Przeczno has musical dispositions similar to the instrument in Sion. It has only one manual keyboard with nine stops (registers). 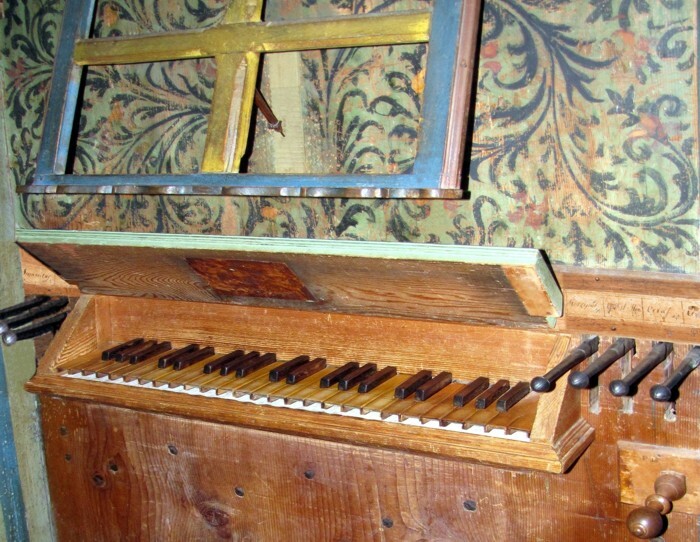 A unique constructional solution distinguishes the instrument in Przeczno among the seventeenth-century organs. It is the location of the wind chest low to the floor while it is usually located above the manual keyboard. So, if you want to listen to original organ music from the Baroque period, you should listen to concerts performed on instruments dating back to the same period, preserved in their sacred surroundings, often still Gothic churches.